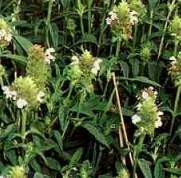 Other Common Names: Self-heal, Prunella, selfheal, heal-all, heal all, healall, xu ku cao, blue curls, brownwort, carpenter's herb, sicklewort, carpenterweed, carpenter weed, common selfheal, dragonhead, hookweed, sickleweed, hook-heal. slough-heal, brunella, heart of the earth. Notes: Good foremost internal and external due to its astringent action. Also good for sore throats. PRUNELLA VULGARIS. As name suggests, infusion is effective medicine for most internal and external wounds due to its astringent action. Also as a gargle for sore throat.